We have seven sportsman homes in Lehr, along with a travel trailer on Dry Lake available for rent. These homes are fully furnished and we can accommodate up to 16 people in one of the homes. We have inside game cleaning areas for all of our homes and each of them are pet friendly if they are friendly to our house. We also offer boat, motor, ice shanties and ice auger rentals. We take pride in making your stay with us comfortable and successful. Lehr is in the middle of a 45 mile wide patch of lakes and pothole lakes that start at the North and South Dakota border and continues north into Canada. See it on Google, map, satellite map, enter Lehr, ND (Now zoom out.) A gift of a glacier. The pothole lakes are heavily stocked with some of the best tasting Walleye, Northern and Perch. Peace and quiet is what you will find since very few lakes have cabins. There is also very little fishing and hunting pressure. The area lakes have good boat landings with no size limits, no slot limits and no closed seasons. 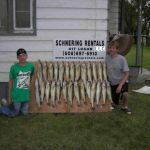 North Dakotas Game and Fish stocks 42 of the area lakes with the maximum number of walleye, northern pike, perch and trout. For example, Dry lake, a 3,782 acre lake in McIntosh County received 644,840 fingerling walleye in 2004. Some of the perch lakes have some of the best jumbo perch action that will make you wish you lived here! 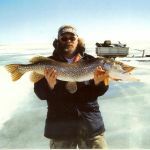 Ice fishing is great all winter long. 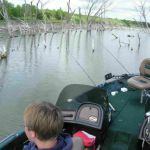 We provide all of our clients with maps of the area lakes and have the best fishing spots marked for you with GPS points. We also provide you with great fishing techniques so you can stay on top of your game and make your trip a successful one. 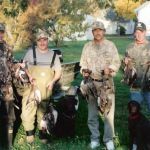 Not only do we have some of the best fishing around we also have fantastic duck, goose, swan and sandhill crane hunting. 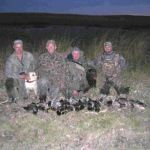 Phesants, Sharp Tail Grouse and Hungarian Partridge are abundant and wild! Our white tail bucks compete with those in Alberta, Canada. So let us help you with your hunting, fishing and vacationing needs. NOTE: We furnish all of the little things that you tend to forget but still need like - laundry soap, softener, toilet paper, paper towels, hand soap, coffee filters, potato peelers etc... We also have outside game cleaning for all and we supply heavy bags for entrails. 103 N. McIntosh street (HWY 30) - Accommodations for up to sixteen. Five bedrooms; 1st floor has 1 bedroom with two extra long bunk beds and the 2nd bedroom with one extra long bunk bed. Second floor has the 3rd bedroom with one bunk bed, the 4th bedroom with two extra long bunk beds and the 5th bedroom with two extra long bunk beds. The main living room has three recliners and a couch. There is also a 2nd living room with four recliners and a couch. Kitchen, dining room, 2 1/2 bath, mud room with laundry facilities and 2nd refrigerator, basement has freezer and two game and fish cleaning tables with large sink. Attached garage has lots of floor space for your stuff and dogs. Out the back door we have a fenced in area for dogs as well. Two Bedrooms; 1st floor has 1 double bed and one extra long bunk bed along with one rollaway bed; 2nd bedroom has one extra long bunk bed. A large living room (den) with queen sleeper sofa and four recliners. Kitchen, dining area, 1 1/2 bath, laundry facilities and game and fish cleaning table with large sink in basement . 315 S. McIntosh street (HWY 30) - Accommodations for up to ten. Five bedrooms; 1st bedroom has one queen bed. upstairs 2nd bedroom has one extra long bunk bed; 3rd bedroom has one extra long bunk bed; 4th bedroom has one extra long bunk bed; 5th bedroom has one extra long bunk bed. Living room includes four recliners and a couch with built in recliners. Kitchen, dining area, 1 bath, mud room with laundry facilities and basement with 1/2 bath, freezer and game and fish cleaning table with large sink. 323 S. Logan Street - Accommodations for up to eight. Three bedrooms; 1st bedroom has one extra long bunk bed and one single bed; 2nd bedroom has one extra long bunk bed and one single bed; 3rd bedroom in basement has two single beds. Living room includes four recliners and a couch. Kitchen, dining area, 1 bathroom, mud room with 2nd refrigerator and basement with freezer, game and fish cleaning table with a large sink and laundry facilities. 417 S. Logan Street - Accommodations for up to nine. Three bedrooms; 1st bedroom has one bunk bed and a double bed; 2nd bedroom has one extra long bunk bed and one single bed; 3rd bedroom in basement has one single bed and a double bed. Living room includes five recliners and a couch. Kitchen, dining area, 1 bathroom, mud room with laundry facilities and basement has a 1/2 bath freezer and game and fish cleaning table with large sink. Five bedrooms; 1st floor has two extra long single beds; 2nd floor has 3 bedrooms, three double beds, two single beds. Basement has two single beds. Kitchen dining area. Laundry facilities with an extra shower. 3 bedrooms and nine ex-long twin beds, upstairs. AC and cable. Living room with recliners and a couch bed. Large Kitchen dining area, Laundry facilities. One and a half bath rooms. Fish cleaning in the basement and outside, both with freezers. Camper (32 Foot) at Dry Lake - Accommodations for up to three. Two bedrooms; 1st one double bed; 2nd one double couch bed. Living room, nice swivel chair, a folding chair, a couch and of course binoculars. Kitchen dining room, gas refrigerator, four place toaster, coffee pots, gas stove & oven, radio, smoke and CO, gas detectors. We supply seven gallon water jugs. Bathroom has a tub with solar shower bag (can heat water on stove ). Out house. New gas furnace and generator. Outside game and fish cleaning table with a sink at the end. We supply heavy bags for entrails and trash. Storage shed, 8' x 12' ice shanty for storage or could sleep two (has heat). A 14' boat and 15hp motor. 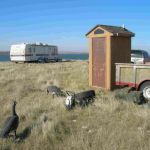 Located on Dry lake with very beautiful views, sounds of nature, ducks, pheasants, song birds, deer, no sounds of civilization and no houses on the lake. Great walleye and northern pike fishing from shore (100 feet). This place drains the stress from you. Cell phones work well. The camper is on 40 acres of great pheasant hunting in addition to having great duck hunting 200 ft from the camper. $40./NITE/PERSON PLUS $2.00 SALES TAX = $42.00 - DEPOSIT OF $200. ADD $50. FOR EACH ADDITIONAL PERSON. SORRY NO DISCOUNTS FOR GUIDING!